Every time I travel around the country to our Embroidery Parties I meet quilters that want to add embroidery designs to their quilts and embroiderers that want to learn how to quilt. Because of these requests we released our Mix and Match quilting line last year so everyone can create beautiful embroidered quilts with ease. To me this collection combines aspects of quilting that you can wear and display, except not on a quilt! We combined traditional crazy quilting techniques with embroidery for these beautiful crazy quilt shapes. There are all different shapes filled with crazy quilt patchwork along with wonderful designs and sayings. 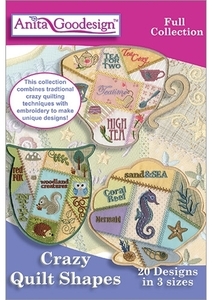 They are as easy to create as standard applique plus they will allow us to combine our favorite fabrics! There are 20 different designs and each of the design comes in 3 different sizes. If you like these designs, make sure to tell us so we can design even more. Holiday shapes anyone?